Introducing KÜRYAKYN new XKürsion™ luggage line, featuring Thermo-Molded material that will hold its shape even under the most demanding use. A host of other rider friendly features such as anti-scratch D-rings, glove friendly zippers, a unique shape designed specifically to fit the contours of any bike and multiple mounting points for each bag are sure to make this your go-to line whether you are going for a short afternoon ride or a cross country XKürsion™. Best Back Seat Bag Ever!! Had the other name brand bag for my Alaska ride in 2012 and wished I had wheels and a handle. Well, that problem has been solved with the XW 5.5 as it is tough, strong, has plenty of storage space, compartments, straps, etc. This bag is huge and very versatile for all kinds of bikes but for my GL1800 Honda Goldwing, it definitely works for me. Buy it.....or suffer and be your own pack mule! I bought this bag to travel the open road! Oh yeah. This bag has plenty of organizer/pockets for my OCD/ADD-which I appreciate. The straps held the bag in place for about 8 hours of riding without needing to be adjusted. Considered other bags with pads for solo riding, however this was the right choice for me. The top pocket seems to be more for aesthetics and not function. The wheels are awesome. 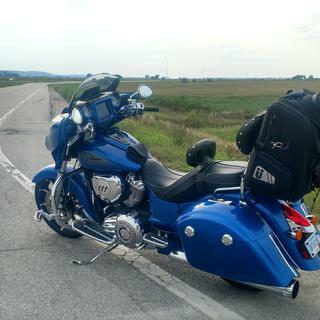 I was able to use the handle while extended to hold my sissy bar/luggage rack as well as my backrest and helmets. I just rolled everything inside the hotel for safe keeping. Whaaaat are you serious? Yes I would recommend you buy this bag. Then I would recommend you spend less time reading reviews like mine and go riding because like a good friend told me once Riders Ride. Check it out-keep your head on a swivel- or meet your maker! Excellent product, especially because it was on sale! Holds a ton of stuff and it looks great (albeit kinda Europeany-like). Quality is top-notch. Would easily buy it again. Excellent product and transaction. The bag is high quality and worth every cent. Bag is huge compared with most bike bags. Got everything in it that normally takes two bags. When fully packed, it is heavy, so the roller bag function is great. Two compartments and a little thought packing kept me from digging for clothes so much. Plenty of tie down options. My rating is based on comparison with other bags I've had. Will this bag fit a 2016 harley road glide? Will this fit well on the back seat of an Ultra Limited? BEST ANSWER: Yep. I have a 2018 Indian Chieftan with only a luggage rack. The luggage has several different options to strap down. Think it will fit almost any motorcycle. Great bag! thanks but that really doesn't help me. Sorry Bonnie I should have been more clear. Yes! Yes it will fit well on your Ultra Limited.If your not happy with it I'm sure you can return it. Best get yourself a box with the dimensions of the bag and see. It is a big bag. Very sturdy. Well made. will it fit on a Honda F6b?